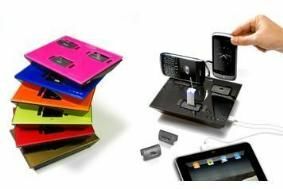 IDAPT's universal charging station gets colourful for Christmas | What Hi-Fi? The innovative unit, able to charge up to four devices at once thanks to its range of interchangeable charging tips, comes complete with six charging adapters. Buyers can order more tips, or change the set supplied as standard, via the IDAPT online store, where it's also possible to select one of the new colours. The standard model is available at £40 in gloss black, silver or white, complete with charging adapters for iPod/iPhone, micro and mini USB, and Nokia, Sony Ericsson and Samsung phones. Or you can choose one of the new colours – Light Blue, Metallic Blue, Lime Green, Matt Black, Hot Pink or Scarlet red – complete with four charging tips of your choice for the same price. The i4 can be used with up to 4000 devices, from mobile phones to satellite navigation systems and even the iPad, and can also be equipped with an adapter enabling it to charge conventional rechargeable batteries.